It was time to bid goodbye to the lovely hill resort – Ooty – and to move on to another great destination, the beauty nestled in God’s own country – Munnar. While one may be excited to reach his destination, the journey has its own charm and could sometimes be as beautiful, if not more, as the destination. So, not underestimating the importance of the path traveled, we cover our journey from Ooty to Pollachi as part of this article. The reason for a separate article on this leg of the journey is the ride on the amazing toy train downhill – the marvel of Indian Railway’s Mountain Railway. This is one of the very few tracks going to the top of the peaks and is definitely worth a separate article in itself. 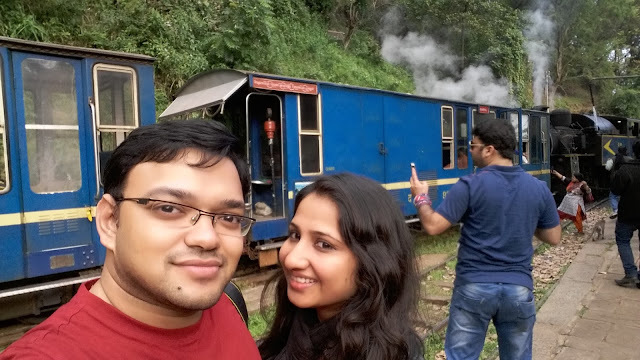 As we realized that it was time to leave, we reached the Udhagamandalam Railway Station at about 2 PM on 25th of December, just in time to board the Nilgiri Express, the Toy Train. The train is also known as the Nilgiri Mountain Railway or the Blue Mountain Railway. This historic train is acknowledged as a world heritage site since 2005. This toy train of Indian Railways is nothing short of an engineering marvel and its builders would have had to work strenuously to overcome the challenges of nature – especially the sloppy terrains and unfavorable weather conditions. When the first train rolled on this section in 1989, it was only after a long bureaucratic hurdle of 45 years since the project was first conceived. There are eight functional railway stations on the entire section from Ooty to Mettupalayam. The distance of 46 km from Ooty to Mettupalayam takes about four and a half hours as the train averages little over 10km/hr because of safety considerations. The ride takes you through 208 curves, 250 bridges and 16 tunnels over the journey and the attempts to blend the construction with nature is evident. The curves are embedded along with trees, the tunnels have vegetation all around and bridges have beautiful arches in their design. We were seated in a wooden compartment which looks like old railway bogies with individual entrances for each set of seats. The green-blue hues of the train were apt for the environment as it blended well with nature through which it was destined to pass on each journey up and down the hill. We had a small group of foreign tourists as our co-passengers – a couple from Europe and an old lady from the US – who would experience this amazing ride with us. The group was really friendly and we got along well with them from the start. The interaction started with courteous introductions soon escalated to sharing of tourist information, knowledge sharing discussions and huge roars as the train passed through tunnels. Their curiosity to know this country and various sites and behavior did make the journey a bit more interesting. And then there was me – never bored from boasting and blabbering to satiate the innocuous curiosities and advance my networks. As the train pulled out of the station, we were greeted with beautiful scenes of nature - mountains on one side and deep valleys on another. We enjoyed the views of each valley with an awe of amazement. We were being offered raw views of the green gigantic cultivated steps – terrace farming, slopes covered with houses and streams of water gushing down the hills. Water streams, some minor trickles, others large waterfalls, could be seen at every curve on the route. While nature showered its charm on us, the journey continued with its excitement and eye soothing views. Soon we could see the gradual rise of tree plantations and we realized that we were soon reaching Conoor, the same stop where we missed the views of the plantation in a hurry to reach Ooty on our forward journey. The train stopped at three stations before it reached Conoor where it had a 20-minute halt. It was quite a big halt for us and we assumed that this was probably to give passengers time to freshen up as the train cabins were devoid of “facilities”. However, over hot coffee in the chill of cool breeze, we came to know that passenger convenience was not the only reason for the long-scheduled stop. This was also an operational requirement. We saw an old steam engine came rolling in to everyone (read tourists) amazement. The train changes its locomotive – engine – at Conoor. Until here, the track section is relatively flat and hence a diesel engine is used to power the train. From Conoor onwards, the job is delegated to smoking black and hot steam engine. This is a Swiss made steam engine which, though over 50 years old, yet bravely faces the twists, turns and slopes of Nilgiri. Gradient from Conoor to Mettupalayam is too steep for a diesel engine and hence a relatively powerful, but inefficient, four stroked engine is brought in to complete the task in hand. We all know that these energy guzzlers and heavy lifters of the past are a rare species now with Indian Railways. Except from some hill railways and luxury tourist trains (Fairy Queen for instance), these are only found in museums. And hence the excitement was bound to creep in. Everyone watched with curiosity and bated breath as the new engine shunted in with the train. Finally, the train embarked on this second leg of the journey, this time significantly slower because of the changed engine and steeper path. Along with the change in engine, there is another aspect which is different from an operational perspective. A safety provision engrained in track design kicks in from Conoor – the rack and pinion arrangement which holds the train and supports braking on steep gradients. As the train moved, we could relate and reminisce the classical hushing noise with which a steam engine moves and tried to replicate the noise – Chuk Chuk, Chuk Chuk – exactly as we were taught in our childhood. Occasionally, we would see and exclaim on a cloud of fumes emanating from the steam engine. The rising clouds of black fumes reminded me of the opposition this train has faced in recent years. There are many who raise concerns about the train’s operation from an environmental point of view – obviously, the steam engine is energetically inefficient and pollution emitter. There is a genuine threat to the local vegetation animals in the woods surrounding the tracks. However, I do not believe that shutting the operations of this train is the only possible solution to those concerns. It seems evident that Railways have made every effort to ensure that the train causes minimum impact on the environment. They use an alternate engine to the extent possible. They have also dedicated themselves to developing horticulture in the zone to compensate for the ill-effects that the train may have to vegetation. There is also a sustained effort to promote suitable greenery by the tracks which is resilient to the smoke from the train. Next big stop for the train was Hill Groove which had 15 minutes of scheduled stoppage. We had some local snacks called bakhri and tea as refreshments and boarded the train for the next leg of the ride. Locals and train staff advised us that this is the most exciting part of the journey and on their advice, we took a more strategic position to place ourselves - at the back of the train - to allow us the uninterrupted view of the scenery. Then began the crafted maneuvers around hills, tunnels and bridges for this part of the journey. The view, undoubtable, was much better here as the slopes were far steeper and scenery far more attractive. The waterfalls grew in strength and with the new position, the view became absolutely heart clenching. Added to this, was the fact that we were now standing with the train’s guard who was happily sharing his experiences working on the train. Talking to the locals and the train staff did tell us one thing – people there are really proud of the natures beauty and are passionate about the work they are doing. They would go an extra mile to help and convenience the tourists. The guard showed us pictures of how elephants would come on the tracks and form quite a curious scene by stopping the train for as long as the creature desires. It was not long after this narration that we got to witness something similar first hand. At one instance, there was a wild cow running on the tracks and honks of the train weren’t enough to deter it from its way. The train crawled slowly behind the cow for a few minutes, with the driver trying his best to persuade the cow to leave the way using the honking horns, which were pretty strong for the purpose of a “toy train”. Finally, the driver gave in and a guard had to go after the cow to personally request a right of way – read steer the cow away with a stick. It was then that the train rolled in freely towards its destination. At another instance, we saw a person rising up from the tracks after the train had passed. While it was an interesting phenomena for us, we were told that this is part of everyday routine. The rough terrain and lack of connections across hills force the local to use railway bridges – conveniently situated - to cross difficult areas. When they realized that a train may be approaching, they would lower themselves down to the tresses of the bridge and let the train pass overhead. Probably not the best from a safety point of view, but then there is a limited choice that the locals have. A side footpath along the bridge may help the cause, but then it seemed infeasible to my eyes and mind. Well, it is what it is and we weren’t much mindful of these serious thoughts at the time. The exceptionally perfect view continued to humor us and the deep gorges between hills directly over the narrow bridges of this mountain railway soon took those safety concerns away. While we were chatting with the guard about his fortune of traversing these paths daily, he interrupted to alert us about the upcoming point and asked us to be ready with our shooting devices as we were going to pass through an interesting spot. Touristic curiosity took over us and we armed ourselves with the best possible position and readied our finger on camera shutter. The train passed through a big arch bridge which was the shooting spot for the famed Dil Se song – Chaiya Chaiya. The journey continued and so did the scenery. The scene lasted up-to about a few kilometers before Mettupalayam, the final station of this wonderful journey. We reached Mettupalayam at about 5:30 in the evening and disembarked the train after bidding good-bye to our co-passengers from across the borders. We then proceeded to our car for the further journey up to Pollochi. However, before getting into the car, we noticed a Railway Museum across the station and paid a quick visit to the carefully picked collection of railway equipment related to the Toy Train and other track/train memorabilia. It was only after putting down our views in the guest register there that we proceeded to our next destination. After about an hour and a half and covering about 35 kilometers, the driver informed us that we were entering the famous South Indian city of Coimbatore. The driver took us through most of the spots within the city and provided a good context of the city, the local lifestyle and the development through the years. Coimbatore is the second largest city in Tamil Nadu and is famous of its industrial setup especially in textiles and automobile sector. Located by the Western Ghats, this city is also a gateway between Tamil Nadu and Kerala, along with a landing site for Ooty – the perfect place from a tourist’s standpoint. We drove through the city and touched some tourist spots on the way. Things that stood apart was the Town Center, located within the bustling city life and the famous Vinayagar Thirukoil temple. We reached Pollochi by about 9 PM. After a good dinner, we retired to bed as we had planned a real early morning next day.